He's going to help choose a successor first. This will be Microsoft CEO Steve Ballmer's last year. He intends to stick around long enough to help choose a successor and then leave, a process that should take twelve months. "There is never a perfect time for this type of transition, but now is the right time," says Ballmer, as he praised the current leadership team, and wished them every success. He could have stuck around, he says, but right now the company needs someone who's going to be in the hot seat for the long term, to help plan company strategy, and that person was never going to be him. Ballmer has fond memories of his time with the company. "I love the bigness and boldness of our bets," says he, possibly with an eye on current events. Ballmer's been a company man since 1980; he was Microsoft's 30th employee, hired as a business manager - the company's first - by Bill Gates himself. It wasn't that long ago that Ballmer took control of the Xbox Division after Don Mattrick jumped ship; it's not clear whether Ballmer intends to hand that off to someone else, or whether it will become the next CEO's responsibility. During his tenure Ballmer's been criticised for being an administrator, not a leader; the sort of person who'd let brilliant opportunities slip by, content to follow rather than set trends. Microsoft's share price, which has stayed stagnant for some time, went up 8% when the news broke. "I take this step in the best interests of the company I love," says Ballmer. "It is the thing outside of my family and closest friends that matters to me most." We'll keep you posted as to who ends up in the hot seat next. 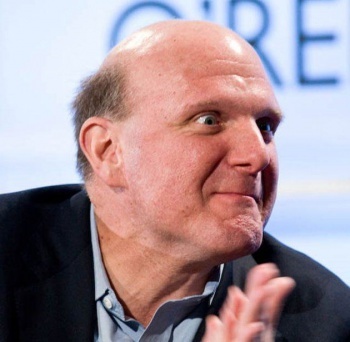 As for Ballmer, good luck to him; and good luck to his successor, for that matter.